ZERO AUTO-SHIP, CLUBS, OR AUTOMATIC BILLING! We believe in letting you buy exactly what products you want, when you want! All orders will receive a minimum of one free makeup and/or skincare sample of our choice. Don't worry, although your free samples will not appear in your cart, we'll make sure the correct number gets included with your order. The samples are selected from our wide range of mineral makeup and natural skincare, but occasionally we will feature a brand new product or items from our seasonal trends. *We hate spam too and will never give out, sell or rent your email or phone number! We will not bombard your inbox or phone with numerous emails/messages either! We want you to read it...not delete it!! haha! Learn more about our Real Beauty Rewards here! Learn how easy it is to earn commissions by sharing on your favorite social media outlets, here! Domestic orders up to $14.99 receive a discounted USPS shipping rate of $3.99 per order, not per item! Domestic orders over $15 receive free shipping! We ship worldwide, click on the banner for details! I've got cabin fever, and really need some color to brighten my day! What about you? I think a big discount is in order! 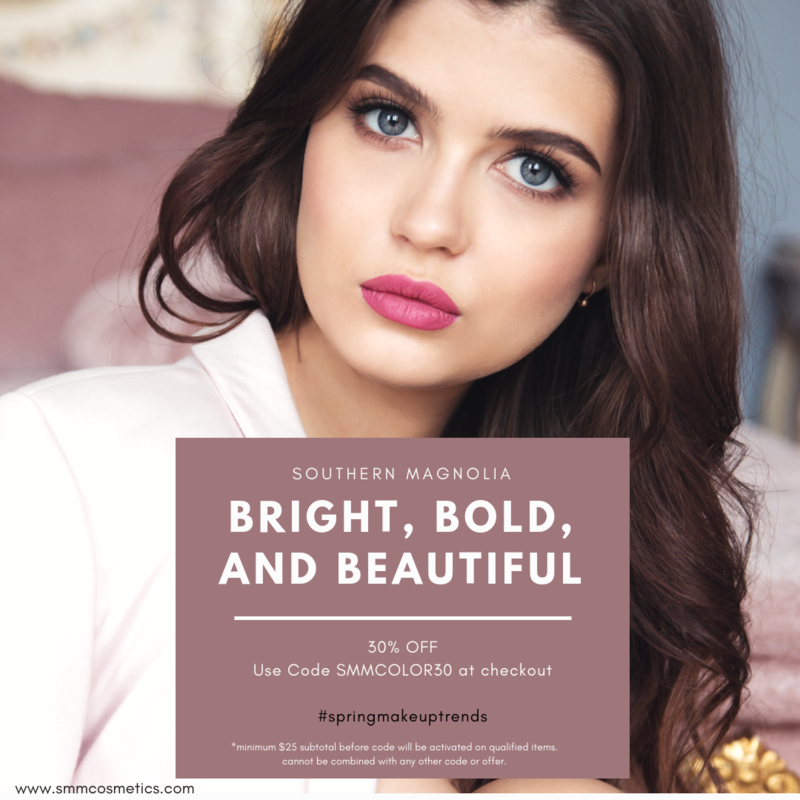 Let's brighten your day with 30% OFF Southern Magnolia color in eyeshadow, liner, mascara, lipstick, blush, bronzer, and more from qualifying categories below! Hurry! In-stock items only. Enter Code SMMCOLOR30 at checkout. Minimum order subtotal $25 before code will be activated on qualifying items. Sale expires Wednesday, Feb 27th at Midnight. p.s. if you are a member of our customer loyalty program, store credit is automatically redeemed on your order when you're logged into your account...saving you additional $$ off! *Coupons cannot be combined. Only one code per order. No rainchecks. Coupons not valid on samples, gift certificates, or previous orders. If you love free beauty gifts with purchase, then get ready to GWP today at Southern Magnolia Mineral Cosmetics! *Promo ends midnight pacific 1-27-19, or while supplies last. 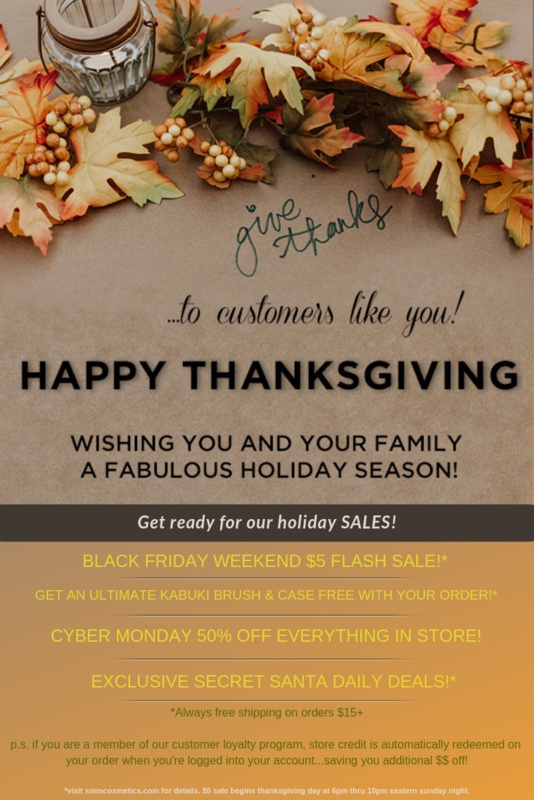 What a fabulous way to "try us out" with today's free GWP and bonus! Deluxe samples are generously sized with enough to last 2+ weeks or more depending on use. 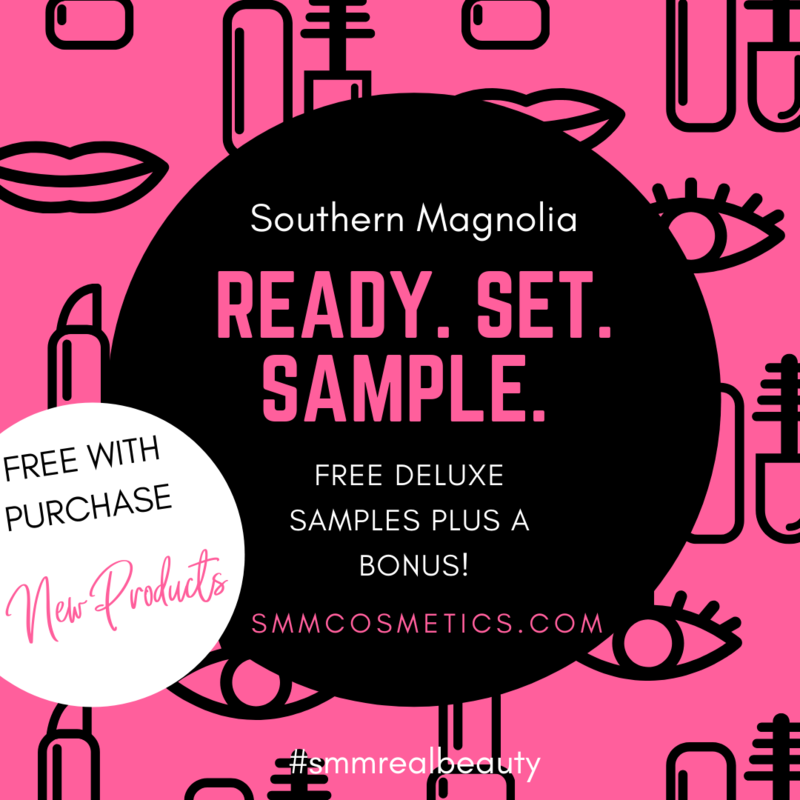 Choose from a variety of products like Southern Magnolia's new depuffing eye cream, regenerative night cream, or other skincare solutions to several new spring makeup colors, face powders, customer favorites, and top rated products. 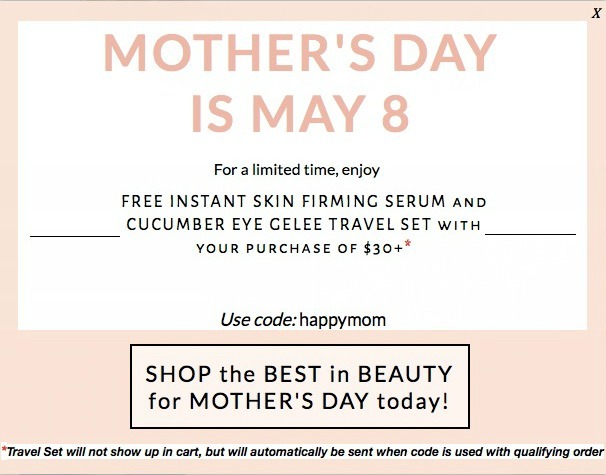 Click on the image to get yours! *Free shipping on orders $15+ is valid for domestic orders only. *Black Friday $5 Flash Sale weekend promo begins Thursday, 11/22/18 at 6pm eastern and expires Sunday, 11/25/18 at 10pm eastern or while supplies last. NO CODE NEEDED for this flash sales event. **Valid in the Sales Category only with a $25 minimum purchase. 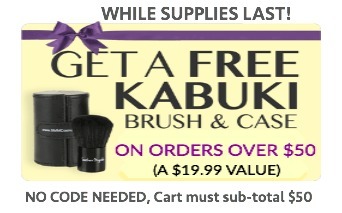 *Get Southern Magnolia's luscious ultimate full size kabuki brush and protective case free with your qualifying order. **Minimum purchase $50. This is a $25 retail value for FREE! Offer valid now thru Sunday, 11/25/18 at 10 pm eastern or while supplies last. No code needed, it will be added to your cart automatically with qualifing order. *50% OFF storewide on Cyber Monday, the biggest online shopping day of the year! Promo is 1 day only and expires at midnight pacific, Monday 11/26/18. Discount offer does not apply to previous purchases. **Take 50% off your order of $40 or more using promo code: CYBER50 Promo code must be entered at checkout to see discount. *Exclusive Secret Santa Specials will be announced on social media daily including facebook, twitter, pinterest, and instagram. Be sure to follow us to score these incredible offers! Only one coupon code may be applied per order. In-stock items only. All offers are valid on specific dates while supplies last. No rainchecks. Coupons not valid on samples, clearance items, gift certificates, or previous purchases. All Sales during these exclusive shopping events are final. Offer valid at webstore SMMCosmetics.com only. We reserve the right to modify or cancel this promotion due to system error or unforeseen issues. ***No changes to order can be made once it has been processed. **Due to the anticipated volume of orders expected, there may be a 24-48 hour delay in shipping orders. Offer Expired! ***Must order on our specially priced clearance page located here to receive today's promotion. All products in clearance category only are $5 each after code has been entered in your shopping cart! Only one code per order. Valid online only. Offer ends midnight pacific 6/20/17 unless otherwise noted or while supplies last. All sales final during this special promotion. Offer Expired! Our kits make a nice gift for anybody, especially yourself! Buy any makeup kit today and get Southern Magnolia's Flawless Face Makeup Brush PLUS our Concealer Definer Brush Duo FREE! That's a $25 retail value for free! No code needed! Free US shipping too! * OFFER ENDS SUNDAY, JANUARY 15, 2017 at MIDNIGHT or WHILE SUPPLIES LAST! Coupons cannot be combined with any other promo code, coupon, or discount offer. In-stock items only, excludes all samples, and all sales and/or clearance items, gift certificates. No rainchecks. Not valid on previous purchases, and cannot be used to pay shipping cost. Offers subject to end without notice. Offer valid for new sign-up customer subscribers only. Valid at SMMCosmetics.com only.